Lootbag #4: What was your favourite So Gelleesh blog post and why? Ging totally got what one of my advocacies is about. Well, yeah, I still do reviews of non-local branded beauty products but I try to, as much as possible, go through more local branded products because I believe that our local products are really worth trying. Plus, think about it, reviewing more local branded products can actually help these brands improve more, right? Wouldn’t it feel nice if someone from a different country would actually crave for one of our local products? Imagine my cousin from the US is going crazy over Snoe’s It’s Oat-K, It’s Alright Cleansing Oil. Isn’t that awesome? Thanks Maria Kaycee for being the most active Facebook user in my page. I appreciate how she also shares my page on her timeline and comments on the things she can relate to, so yeah, thanks, dear! 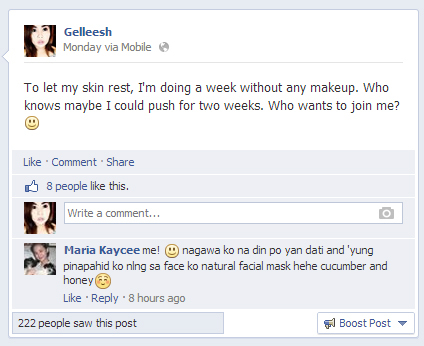 Please do send me an email at: gellieabogado@gelleesh.com on how you want to claim your prize. I mean I have 9 loot bags to send out. If we can meet at SM North or Trinoma or somewhere up north, good then. But if you’re like too far away from the National Capital Region, yeah, send me your mailing address and I’ll send you ze goodies, okidoks? And I would love to meet you guys as well, of course! Gelllliiieee! I didn't know that I will be the commenter of the month! Natouch din ako!! Meet up nalang :) will email you :)) Thank you!! Mwuah!! !